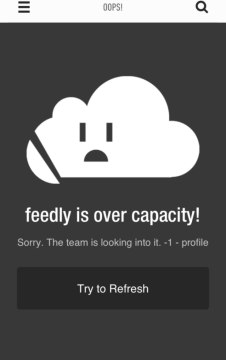 Our attempts to use Feedly on iOS since the death of Google Reader have been hit with the following error: “Feedly is over capacity.” That has made us learn to enjoy Digg Reader on iOS a bit more. Sorry. This is not a capacity issue but a bug! During the login, it tries to connect to Google Reader to help you migrate your feeds. Unfortunately, Google changed last night and is returning HTML instead of JSON and the feedly mobile client 16.0.522/530 has trouble digesting that, showing a error card instead (note: if you are already logged in, you are safe as long as you are not logging out). A fix for this problem is coming in version 16.1 of the iOS app, which has been submitted to Apple for review and will most likely take a few days to push out. The Feedly team suggests in the meantime to check out Reeder, Newsify, Mr Reader and Byline as alternatives in the meantime. So if you’ve encountered this error, know a fix is coming soon via an app update. Stay tuned.